Before You Start to Write Your Memoir - Write Nonfiction NOW! Writing a memoir, which is a full-length book after all, is not going to be easy. You know—or, at least, suspect—that it will take a lot of time and, ultimately, a lot of sacrifice. But, it is not more difficult than you can tackle—if the task is right for you. Should you start writing now, should you wait until you are ready—and what does “ready” mean—or, possibly, should you cross this project off your to-do list? The idea of writing your story has perhaps fascinated you for a long time. So now you are exploring what actually writing the memoir you have been talking about for so long might be like. You may even have jotted down a few notes, and it has occurred to you—and this may have been a chilling moment but it need not have been—that writing a memoir is not the same thing as talking about writing a memoir. Talking about writing is exciting, even exhilarating, but writing might be full of tedium and discipline, the dailiness of producing yet more text, and not quite as exciting as speaking about writing a memoir. Not fair! Between this excitement you are probably feeling about writing a memoir and the realization that it will likely require a whole lot of work fall the doubts and hesitations. “Ought I to write a memoir?” you ask again. How do you think of yourself as a writer? You are more likely to persevere if you think of yourself as a truth finder rather than if you hold on to some romantic sense of how special a writer is. Ought you to write an autobiography (a full life) or a memoir (a specific portion of a life)? Who will be interested in a full life? For most people who are not well known, a full life interests a family but is not likely to interest the public. Many of us have only a memoir that the public will want. Do you need to supplement the information and the background you lack? Even if we are writing about ourselves, we have gaps in our knowledge of the times. Have you enough writing supports (from computer to spouse) and, if not, how do you get enough? The more thoughtful and prepared you are about what you are going to do as you begin, the more pleasant the writing experience is likely to be. The process of deciding to start to write has its own tasks that are appropriate for that time when you are resolving to initiate, or not initiate, the work of writing a memoir. 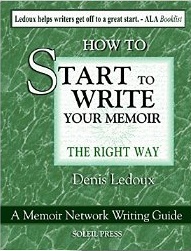 In How To Start to Write Your Memoir, I did not set out to write a book about how to write the whole of a memoir. That is a bigger topic—one that I have covered thoroughly in Turning Memories Into Memoirs / A Handbook for Writing Lifestories. The lifewriting process will involve going through many stages. Each has its requirements and, generally speaking, when the requirements of a stage are not sufficiently met or not properly undertaken, the next stage is likely to be more challenging to accomplish—and possibly overwhelming. Be patient with the process: your success depends on it. If you “lay the foundation” well, your writing will have a successful start and come to a successful completion. One day, you too—as have so many people just like you—will have a memoir manuscript in hand. For more help on starting to write a memoir, click here. Do you have something special to write about? Perhaps that is the experience itself or the perspective you brought to the experience or perhaps the conditions of the experience were sufficient different to warrant being written about. In short, what is unique in what you have to write? Is there an audience for this story? Who needs this story? Answer the “preliminary inquiries” I bulleted above. Does the journaling you have just produced strengthen your resolve to write because it convinced you of the feasibility of the project? If you continue not to be sure, is there another way you can meet the need that writing a memoir would address? Take the Rilke quote below seriously. If this post can convince you that you do not have what it might take to succeed at writing a memoir, then in the counsel not to undertake a memoir, you have received a huge gift of time and energy saved. But, mostly, I hope you can undertake to write your memoir. 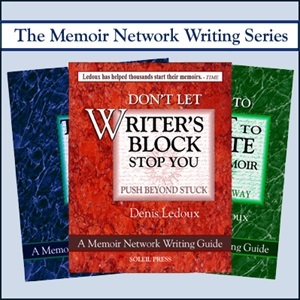 Denis Ledoux is the author, most recently, of How to Start to Write Your Memoir which is Book One in the seven-part Memoir Network Writing Series. Also in publication is Don’t Let Writer’s Block Stop You. A complete list of publications is available here. To be placed on an alert list, send Denis an email.